A class to facilitate planning for a generic second-order car model. where \(v\) is the speed, \(\phi\) the steering angle, the controls \((u_0,u_1)\) control their rate of change, \(m\) is the mass of the car, and \(L\) is the distance between the front and rear axle of the car. Both \(m\) and \(L\) are set to 1 by default. 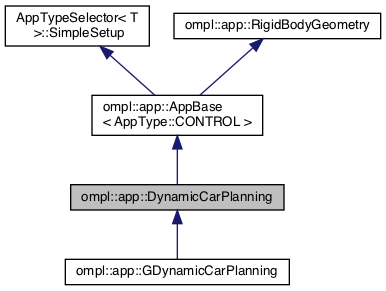 Definition at line 42 of file DynamicCarPlanning.h.